From Romantic Castles and Palaces, As Seen and Described by Famous Writers, edited and translated by Esther Singleton; New York: Dodd, Mead & Company, 1901; pp. 295-299. MEDITATIVE people will find a charm in a certain consonancy between the aspect of the city and its odd and stirring history. Few places, if any, offer a more barbaric display of contrasts to the eye. 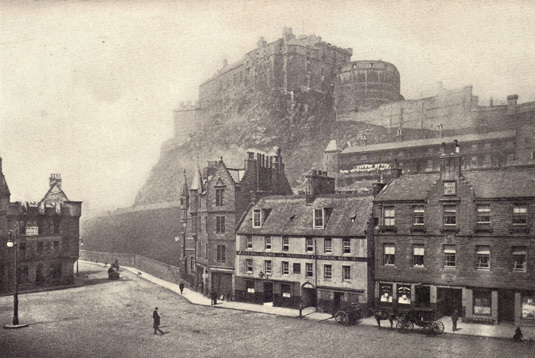 In the very midst stands one of the most satisfactory crags in nature — a Bass Rock upon dry land, rooted in a garden, shaken by passing trains, carrying a crown of battlements and turrets, and describing its warlike shadow over the liveliest and brightest thoroughfare of the new town. From their smoky beehives, ten stories high, the unwashed look down upon the open squares and gardens of the wealthy; and gay people sunning themselves along Princes Street, with its mile of commercial palaces all beflagged upon some great occasion, see, across a gardened valley set with statues, where the washings of the old town flutter in the breeze at its high windows. And then, upon all sides, what a clashing of architecture! In this one valley, where the life of the town goes most busily forward, there may be seen, shown one above and behind another by the accidents of the ground, buildings in almost every style upon the globe. Egyptian and Greek temples, Venetian palaces and Gothic spires, are huddled one over another in a most admired disorder; while, above all, the brute mass of the Castle and 296 the summit of Arthur’s Seat look down upon these imitations with a becoming dignity, as the works of Nature may look down upon the monuments of Art. But Nature is a more indiscriminate patroness than we imagine, and in no way frightened of a strong effect. The birds roost as willingly among the Corinthian capitals as in the crannies of the crag; the same atmosphere and daylight clothe the eternal rock and yesterday’s imitation portico; and as the soft northern sunshine throws out everything into a glorified distinctness — or easterly mists, coming up with the blue evening fuse all these incongruous features into one, and the lamps begin to glitter along the street, and faint lights to burn in the high windows across the valley — the feeling grows upon you that this also is a piece of nature in the most intimate sense; that this profusion of eccentricities, this dream in masonry and living rock, is not a drop-scene in a theatre, but a city in the world of every-day reality, connected by railway and telegraph-wire with all the capitals of Europe, and inhabited by citizens of the familiar type, who keep ledgers and attend church, and have sold their immortal portion to a daily paper. By all the canons of romance, the place demands to be half deserted and leaning towards decay; birds we might admit in profusion, the play of the sun and winds, and a few gypsies encamped in the chief thoroughfare: but these citizens, with their cabs and tramways, their trains and posters, are altogether out of key. Chartered tourists, they make free with historic localities, and rear their young among the most picturesque sites with a grand human indifference. To see them 297 thronging by, in their neat clothes and conscious moral rectitude, and with a little air of possession that verges on the absurd, is not the least striking feature of the place. The Old Town, it is pretended, is the chief characteristic, and, from a picturesque point of view, the liver-wing of Edinburgh. It is one of the most common forms of depreciation to throw cold water on the whole by adroit over-commendation of a part, since everything worth judging, whether it be a man, a work of art, or only a fine city, must be judged upon its merits as a whole. The Old Town depends for much of its effect on the new quarters that lie around it, on the sufficiency of its situation, and on the hills that back it up. If you were to set it somewhere else by itself, it would look remarkably like Stirling in a bold and loftier edition. The point is to see this embellished stirling planted in the midst of a large, active, and fantastic modern city; for there the two re-act in a picturesque sense, and the one is the making of the other. The Old Town occupies a sloping ridge or tail of diluvial matter, protected, in some subsidence of the waters, by the Castle cliffs, which fortify it to the west. On the one side of it and the other the new towns of the south and of the north occupy their lower, broader, and more gentle hill-tops. Thus, the quarter of the Castle overtops the whole city and keeps an open view to sea and land. It dominates for miles on every side; and people on the decks of ships, or ploughing in quiet country places over in Fife, can see the banner on the Castle battlements, and the 298 smoke of the Old Town blowing abroad over the subjacent country. A city that is set upon a hill. It was, I suppose, from this distant aspect that she got her name of Auld Reekie. Perhaps it was given her by people who had never crossed her doors; day after day, from their various rustic Pisgahs, they had seen the pile of building on the hill-top, and the long plume of smoke over the plain; so it appeared to them; so it had appeared to their fathers tilling the same field; and as that was all they knew of the place, it could be all expressed in two words. There is a silly story of a subterranean passage between the Castle and Holyrood, and a bold Highland piper who volunteered to explore its windings. He made his entrance by the upper end, playing a strathspey; the curious footed it after him down the street, following his descent by the sound of the chanter from below; until all of a sudden, about the level of St. Giles’s, the music came abruptly to an end, and the people in the street stood at fault with hands uplifted. Whether he was choked with gasses, or perished in a quag, or was removed bodily by the Evil One, remains a point of doubt; but the piper has never again been seen or heard of from that day to this. Perhaps he wandered down into the land of Thomas the Rhymer, and some day, when it is least expected, may take a thought to revisit the sunlit upper world. That will be a strange moment for the cabmen on the stands beside St. Giles’s, when they hear the drone of his pipes reascending from the bowels of the earth below their horse’s feet. Of all places for a view Calton Hill is perhaps the best; 299 since you can see the Castle, which you lose from the Castle, and Arthur’s Seat, which you cannot see from Arthur’s Seat. It is the place to stroll on one of those days of sunshine and east wind which are so common in our more than temperate summer. Upon the right, the roofs and spire of the Old Town climb one above another to where the citadel prints its broad bulk and jagged crown of bastions on the western sky. — Perhaps it is now one in the afternoon; and at the same instant of time, a ball rises to the summit of Nelson’s flagstaff close at hand, and, far away, a puff of smoke followed by a report bursts from the half-moon battery at the Castle. This is the time-gun by which people set their watches, as far as the sea-coast or in hill farms upon the Pentlands. And while you are looking across upon the Castle Hill, the drums and bugles begin to recall the scattered garrison; the air thrills with the sound; the bugles sing aloud; and the last rising flourish mounts and melts into the darkness like a star: a martial swan-song, fitly rounding in the labours of the day.